Want something different for Valentine's Day? 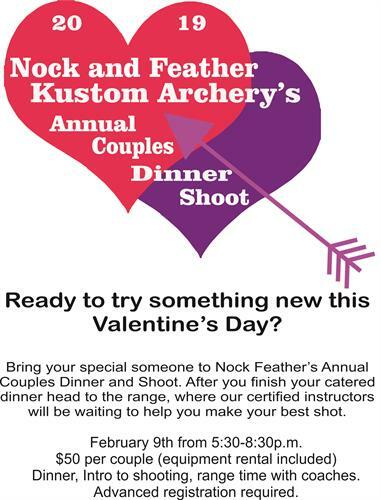 Come join us for a catered dinner, Introduction to Archery Lesson, and some range time with coaches. Don't have archery equipment? Rental for the evening is included. If you are an experienced shooter, bring your gear and someone special out for a nice dinner and some time on the range, sounds like a winning way to spend a Saturday night. Advanced registration is required, call 630-896-3854 to reserve your spot today. Registration closes February 6. Date/Time Information February 9, 2019 5:30p.m.-8:30p.m.